Modern potters interested in the Japanese tea ceremony know that the truly great early tea wares came from Japanese (and Korean) farmer potters working with materials at hand for a rice economy. North American farmer potters worked with materials at hand for a dairy economy. A Tea Master critique of American redware would be interesting. Of course, Sen no Rikyu and the early Masters’ mining efforts ultimately turned their farmer potters into National Living Treasures. American farmer potters ended up making drain pipe. But the West did develop its own ‘tea ceremony.’ Time, place and conversation were prescribed – as in Japan – albeit with differences. Sculpted Asian tea rites derived from ancient meditative disciplines. Western tea rites derived from parlor etiquette. The 17th century introduction of tea and its sibling coffee enormously impacted Western society. Men huddled in coffee houses, debating reality and plotting revolution. Women sipped tea in parlors, discovering strength in numbers and life beyond their husbands’ dictates. Cafes and parlors eventually morphed into the salon culture. This may seem frivolous compared to the solemn atmosphere of chanoyu. But it managed to loosen the shackles imposed by hyper conservative Christian Orthodoxy just enough for later historians to call that brief time period “The Age of Reason.” The Western ‘tea ceremony’ even developed its own sculpted discipline of balancing a dish on one’s knee while politely holding an annoyingly teeny handled cup between thumb and forefinger. Tea propelled pottery to the forefront of Europe’s Industrial Revolution, modifying pottery along the way. Westerners liked their tea hot (to dissolve sugar in) and served individually. Thus, by 1760, necessitating that teeny handled cup. A full tea set eventually consisted of 41 ceramic items: 12 teacups with saucers, 6 coffee cups with saucers, a teapot with stand, a slop “bason,” a sugar “bason,” and a cream ewer. A two person “tete-a-tete” could be as few as 8 items. Distinct foods, like crumpets and scones, accompanied the tea. And it all centered on the tea pot. Before radio, families gathered around their “brown betty.” Watch any old English melodrama and notice how much activity occurs near the teapot. Your tea set’s quality set the tone of your gathering, and helped establish your spot on the afternoon tea circuit hierarchy. Then again, concern for hierarchy was equally reflected on both sides of the globe. The Book of Cups. Garth Clark. Cross River Press/New York, NY. 1980. This entry was posted on July 22, 2012 at 12:14 pm and is filed under Brown Betty, ceramic history, Early American Pottery, Industrial Revolution, Japan, Sen no Rikyu, tea bowl, tea pot. You can follow any responses to this entry through the RSS 2.0 feed. You can leave a response, or trackback from your own site. 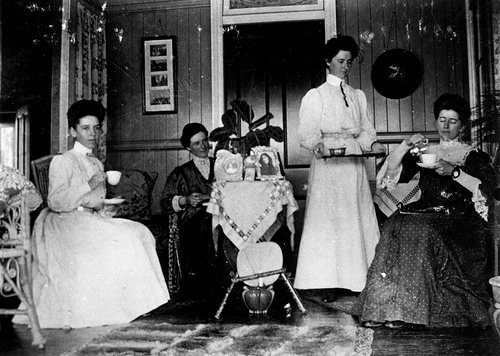 I love the idea of ladies sitting around a keeping room plotting social change over a cup of tea.